Israel is located in the Middle East, bordering the Mediterranean Sea, between Egypt and Lebanon next to Syria and Jordan. The total area of over 20,770 sq km and a coastline of about 190 km along the Mediterranean. The area of lakes (sea of Galilee and Dead sea) 440 sq km (2%). Israel lies between 340°30‘ - 350°45’ W and 29°30‘ - 33°20‘ N. The territory of Israel measures some 420 km from north to south and about 120 km from west to east. The population of Israel is about 7 million of which 85% live in the cities and towns. About 80% of the population Jewish and 20% non-Jewish (mostly Arab). Hebrew and Arabic are the two official languages (English being the most commonly used foreign language). The capital city of Israel is Jerusalem with population of about 700,000 inhabitants. About 40% of the population lives in the metropolis of Tel-Aviv, which is the center of the economy and cultural life. The population annual growth rate of about 1.2% and population density of 305 inhabitants per square kilometer. The growth in population, projected to rise from 7 millions today to nine million by 2020. Administratively, Israel is divided into 6 districts: Central, Tel-Aviv, Southern, Haifa, Jerusalem and Northern. The main cities: Jerusalem, Tel-Aviv, Be’er-Sheva and Haifa. Topographically, Israel is divided into distinct regions: The Coastal region, Hilly region, The Northern Valleys, The Negev region and The Jordan Rift Valley and Aravah. 54% of total area is urban area and 46% agriculture areas. The majority of the country is plain area; there are mountains in north, eastern and the south. The highest peak in Israel in the northern Galille mountains is 1,208 m (Har Meron) above sea level and the lowest point in the Dead Sea is 417 m below sea level. Israel has a technologically advanced market economy with substantial government participation. It depends on imports of crude oil, grains, raw materials and military equipment. Despite limited natural resources, Israel has intensively developed its agricultural and industrial sectors over the past 20 years. Israel imports substantial quantities of grain, but is largely self-sufficient in other agricultural products. Cut diamonds, high-technology products, and agricultural products (fruits and vegetables) are the leading exports. Israel usually posts sizable current account deficits, which are covered by large transfer payments from abroad and by foreign loans. Roughly half of the government's external debt is owed to the US, which is its major source of economic and military aid. On 14 May 1948, following the 29 November 1947 UN resolution, Israel proclaimed its independence. Israel focused on building the state, and the gates of the country were thrown open, affirming the right of every Jew and World War II survivors to come to the country. By the end of 1951, the population was a total of 687,000 men, women and children had arrived. Towards the end of the first decade, the output of industry doubled, as did the number of employed persons, with industrial exports increasing four-fold. Vast expansion of areas under cultivation had brought about self-sufficiency in the supply of all basic food products except meat and grains, while some 50,000 acres (20,000 hectares) of mostly barren land were afforested and trees were planted along almost 500 miles (800 km.) of highway. The educational system was greatly expanded and school attendance became free and compulsory for all children aged 5-18. During Israel's second decade (1958-68), exports doubled, and the GNP increased some 10 percent annually. While some previously imported items such as paper, tires, radios and refrigerators were now being manufactured locally; the most rapid growth took place in the newly established branches of metals, machinery, chemicals and electronics. Since the domestic market for homegrown food was fast approaching the saturation point, the agricultural sector began to grow a larger variety of crops for the food processing industry as well as fresh produce for export. A second deep-water port was built on the Mediterranean coast to handle the increased volume of trade. Israel's foreign relations expanded steadily, as close ties were developed with the United States, British Commonwealth countries, most western European states, nearly all the countries of Latin America and Africa, and some in Asia. Extensive programs of international cooperation were initiated, as hundreds of Israeli physicians, engineers, teachers, agronomists, irrigation experts and youth organizers shared their know-how and experience with people in other developing countries. The cycle of Arab rejections of Israel's appeals for peace was broken with the visit of Egyptian President to Jerusalem (November 1977), followed by negotiations between Egypt and Israel under American auspices. On 26 March 1979, Israel and Egypt signed a peace treaty, bringing the 30-year state of war between them to an end. Since the signing of the Egypt-Israel peace treaty, various initiatives were put forth by Israel and others to further the peace process in the Middle East. These efforts eventually led to the convening of the Madrid Peace Conference (October 1991), held under American and Soviet auspices, which brought together representatives of Israel, Syria, Lebanon, Jordan and the Palestinians. The formal proceedings were followed by bilateral negotiations between the parties and by multilateral talks addressing regional concerns. Three years of talks between Jordan and Israel, following the 1991 Madrid Peace Conference, the Jordan-Israel peace treaty was signed on 26 October 1994. This peace treaty ended the 46-year state-of-war between their countries. Israel and Palestinian officials signed on 13 September 1993 a Declaration of Principles (also known as the "Oslo accords") guiding an interim period of Palestinian self-rule. On 24 June 2002, US President laid out a "road map" for resolving the Israeli-Palestinian conflict, which envisions a two-state solution. However, progress toward a permanent status agreement has been undermined by Palestinian-Israeli violence ongoing since September 2000. The conflict may have reached a turning point with the election in January 2005 of the new Palestinian president. Israel is a democracy with a central government and parliament (“Knesset”, 120 seats) elected by the people (suffrage: 18 years) every four years. The government led by the Prime Minister has the real political power while the President has limited political power. The president is elected by the Knesset for a five-year term and representing the country and serves as the symbol of the state. The Cabinet (about 8-18) is selected by Prime Minister and approved by the Knesset. The government is divided into three independent bodies namely: Legislature, Executive and Judiciary. Each body is responsible for a different function of the government. Legislature is responsible for making laws that are implemented by the executive and interpreted by the judiciary branch. There are three levels of court namely Supreme Court, District Court and Municipal Court. No formal constitution; some of the functions of a constitution are filled by the Declaration of Establishment (1948), the Basic Laws of the parliament (Knesset), and the Israeli citizenship law. Israel, as many other countries, has a statutory division of land – the cadastre. The modern Israeli Cadastre was established in 1928 by the British Mandatory Administration in Palestine, and was based on Torrens principles (Registration of Titles). In similar to mapping, which over the recent decades has been gradually undergoing a transition from the graphic sphere to the digital sphere, the cadastre in Israel is now also in transition from analogue era to digital era. The changes instituted thus far, and those expected in the cadastre in the future, could be classified into four stages: Analogue (conventional) cadastre, Graphic (computerized) cadastre, Analytical coordinate based cadastre and Three-Dimensional Multi-Layer cadastre. The institutionalized surveying and mapping activities in the country began in 1920, when the British mandate authorities established a Survey Department and decided that its first task should be the triangulation to cover the populated area of the country. The next and no less important decision was the establishment of juridical cadastre based on Torrens principles. Survey Ordinance came into being in 1929, limiting the profession to licensed and government surveyors, a state of affairs, which has remained unchanged up to the present. The independence brought with it an accelerated development with a great demand for surveying and mapping services on a scale previously unknown. One of the first steps taken was the establishment of a survey school to satisfy the need for surveyors. Photogrammetry came into being towards the end of the forties, as well as the massive development of engineering surveys for housing and road construction. The geodetic control was extended to the southern part of the country. The electronic computer and electromagnetic distance measurements started changing the profession during the sixties. University education became a prerequisite for a surveyor license, which undoubtedly elevated the status of the profession and its practitioners. Research, applicationally oriented, became a necessity for keeping abreast of scientific and technological development. Since 1948, the Survey of Israel (SOI) the successor of the Survey of Palestine is the governmental institution responsible, among other responsibilities, for cadastral mapping in the country. SOI supervises and collects the entire cadastral mapping (block maps as well as mutation plans). SOI is responsible for issuing the instructions and standards for cadastral mapping, and also for licensing surveying and mapping professionals. Settlement of rights was accomplished until now in about 95% of the area of Israel. The population of Israel grew from about 800,000 in 1948 (the establishment of state of Israel), to about 7 million in 2006. Most of this growth was due to immigration, which with natural growth, the increase in standard of living and some changes in the concepts of living, caused high pressure on the demand for land and need for new planning. The advent of GPS revolutionized the approach to the positioning of the geodetic control. The emerging GIS changed the concept of mapping, both the topographical and the cadastral. All these changes in professional practice reflected themselves in the Survey Regulations of 1964, 1987 and 1998, each new set superceding the previous one. With the Torrens method, the subject of registration is the land parcel. The borders of the parcel and objects that are related to it (such as buildings) are thoroughly surveyed, and the area of the parcel is calculated. This type of registration establishes an effective and convenient way for proper real estate management, and effective planning and land transaction. In addition, equitable collection of taxes imposed on the land is enabled. As in every country where the Torrens method has been adopted, the settlement of land rights in Israel was performed only once. However, over the years attention has been given to its updating and improvement. Despite the fact that at present it is possible to achieve centimeter-level surveying accuracy, which is much higher than that achieved in the past, the parcels that have been settled are not being resurveyed. Rather, efforts are being made to optimize the use of former measurements in cases where merging or subdivisions are introduced. About 21,000 square km of the registered area (about 5% of the area is not registered yet) are divided into about 15,000 registration blocks, and about 800,000 parcels. The area included in each block changes according to the block’s boundaries. The scales of the block sheets are from 1:625 down to 1:50,000 and the sheet size is about 60*70 cm. Most of the sheets are in 1:1,250 and 1:2,500. The accuracy in which the boundaries are defined is quite heterogeneous as a result of methods and equipment that were used. Any change in the original settlement of land rights has to be based on mutation plans. The birth of every mutation plan (re-parcelation) begins with a municipal plan. According to the Israeli law of planning and building, every merging or subdivision of parcels should be according to municipal plans. The initiative of such plans can be originated in the private sector, the government or the municipality itself. It may contain one or two new parcels and may be up to some hundred new parcels that can form a new part of a city. The municipal building plan (town plan) is based on some topographic or planimetric map, including the cadastral boundaries as a background (usually in accuracy of digitization of graphic maps). The boundaries of the town plan may not coincide with the cadastral boundaries. In order to register a mutation plan, a licensed surveyor should prepare it. As mentioned above, the mutation plan should fit the town plan. The criteria for this fit are written in the survey regulations that were updated by the SOI in June 1998. The head of the municipal planning authority approves the above-mentioned fit. This approval is a prerequisite for beginning a checking process in the SOI. It should be noticed that according to the same law of planning and building mentioned above, a mutation plan should be accepted by the SOI as “approved for registration” before the plan reaches the Register at the Ministry of Justice. The process of checking is started at one of five district surveyors offices (Haifa, Tel-Aviv, Jerusalem and Beer-Sheba), were most of the cadastral original mapping is kept and used for preparing a mutation plan by a licensed surveyor from the private sector. The most important part of the checking concerns with the correct reconstruction of the old boundaries, keeping the registered area of the original parcels, using all the available official sources. The district surveyor is authorized to decide about the need to check the plan in the field. Another important part of the check concerns with keeping the graphic (computerized) drawings according to the survey regulations, as well as appropriate to the electronic computation formats which guarantees a successful upload to the database of the cadastral GIS. The surveyor who prepared the mutation plan gives temporary new parcel numbers and parcel area size. Once the plan is accepted as approved for registration, it is allowed to go to the land registry at the ministry of justice, which gives final numbering to the temporary parcel numbers, registers the area size and the ownership. The “final numbers” are distributed then to the SOI in order to update the plans and the registration blocks. The Survey of Israel (SOI) is a National Center for Mapping, Geodesy, Cadastre and Geoinformatics. SOI belongs to the ministry of Construction and Housing. The SOI is the agency responsible for the national infrastructure in these areas as well as for number official functions. The SOI is the top professional authority in the country, setting standards, initiating legislation, licensing surveyors, supporting and initiating research and development, actively managing and maintaining the national geodetic infrastructure, the national GIS, responsible for national mapping, topographical and cadastral. SOI supervises, confirms, collects and maintains all the cadastral mapping. The SOI is responsible for cadastral mapping, as a part of an inter-ministry procedure of documentation and registration of rights to land, according to a British mandatory law (Survey Ordinance, 1929). Private licensed surveyors are deeply involved in the cadastral activity. The cadastre system in Israel is based on Torrens registration principles. The responsibility for the inspection and the approval of block maps and mutation plans is shared by five district surveyors and three civil servants acting at SOI central office. The historical, geographic distribution led to heterogeneity of various local methods of working and managing, procedures, data formats, hardware and software facilities, etc. The land registry office (Ministry of Justice) is the governmental institution, which has the responsibility for registration of legal rights in real property. The scope of its activity is over the whole state of Israel and it operates through its 12 regional offices. The legal basis for the registration of rights is the Land Law (1969). Israel has a unique structure of land administration, because of historical reasons. The government is the owner of about 93% of the land, which is leased to the public by various forms of short and long – term leasing managed by the Israeli Land Administration (Ministry of Construction and Housing). The Israeli Land Administration is the government agency responsible for managing this land that comprises 5,750,000 acres. "Ownership" of real estate in Israel usually means leasing rights from the ILA for 49 or 98 years. Its responsibility contains both the communication with the lessees and the marketing of land to the construction market for further development. This structure allows the government to maintain control of the construction market and adjust the supply of land to the changing needs and demands of the market. Guarantee that national lands are used in accordance with Israeli laws. Actively protect and supervise state lands. Make state land available for public use. Plan, develop and manage state land reserves. Initiate planning and development (including relocation of existing occupants). Regulate and manage registration of state lands. Authorization of contracts and agreements with other parties. Provide services to the general public. The land administration practice in Israel involves both the private and the governmental sectors. Although the part of the governmental authorities is relatively dominant, there is a growing trend of deeper involvement of the private resources in the process. This tendency is based on different background and motivations, some derived from ideologies and some based on economic considerations. Private licensed surveyors are deeply involved in the cadastral activity. One of their most important tasks is the preparation of the Mutation Plans of changes in the cadastre. The private sector (which counts some 830 active licensed surveyors) carries out a great variety of tasks in engineering and cadastral surveying, in data acquisition for mapping and GIS, in mapping itself, in management and coordination of housing projects, and is growing in importance as executives of the profession. According to existing law, SOI may authorize private surveyors to execute the supervising of mutation plans prepared by other surveyors. In order to have such an authorization, a surveyor must prove his capability to execute the supervision on high quality level. In 2004, SOI authorized 10 private surveyors to execute the supervision of mutation plans. In 2004, about 3% from the mutation plans supervised by them. 7 additional supervision surveyors were authorized in 2006 and the rate rose to 25% of the total amount. In 2004, there are 819 active licensed surveyors. Many of them (about 455) run private businesses. Others (about 306) are employed by survey firms and about 60 are employed by SOI and government offices. The Association of Licensed Surveyors in Israel is the principal voluntary association in Israel with some 500 members. The association is an active member of FIG and is represented in all the FIG commissions. Besides the Association of Licensed Surveyors in Israel, there are other sister societies, such as the Israeli Society of Photogrammetry and Remote Sensing, the Israeli Cartographic Society and the Association of Land Valuers. A license is necessary to carry out geodetic surveying. Nowadays, there are about 1100 licensed surveyors in Israel (including retired ones). The requirements for getting a license are set in “Surveyors Regulations (The Surveying Profession)” legislated in 1982. For obtaining a license, the candidate should complete both university studies in geodetic engineering and a two year long professional training, with the guidance of an experienced senior surveyor. The training should be focused on preparation of mutation plans. There are a number of further conditions for obtaining a license. The candidate must be a citizen of the state of Israel, he/she has to be graduated in geodetic engineering. A B.Sc. Degree in civil engineering may also be accepted after the completion of university studies in obligatory geodetic subjects. Finally, the candidate has to be examined on some special subjects, among them land legislation; field measurements, relevant geodetic and cadastral computations and the complete procedure of mutation plan preparation. Having fulfilled the educational requirements a candidate for a surveyors license has to complete a two year period of supervised practice, under a surveyor-supervisor, particularly with view to gain the background and expertise expected from a professional licensed surveyor, trusted by the general public and by colleagues in sister professions, such as architecture, town planning, engineering, real estate etc. At the end of the supervised practice period, the candidate is expected to pass an interview directed to test the candidate’s proficiency in applicational matters. SOI is responsible for surveyors licensing. The licensed surveyors (and the candidates) are registered in a register book containing personal details on their academic studies, training period resume, examinations results, annual license fee payment and other practical items. The independence of Israel in 1948 brought with it an accelerated development with a great demand for surveying and mapping services on a scale previously unknown. One of the first steps taken was the establishment of a survey school to satisfy the need for surveyors. University education became a prerequisite for a surveyor license, which undoubtedly improved the status of the profession and its practitioners. Research, applicationally oriented, became a necessity for keeping abreast of scientific and technological development. A basic condition to become a licensed surveyor is to be graduated in geodetic engineering (4 years) or in surveying (3 years) from the Technion – Israel Institute of Technology or from a recognized institution of high education abroad. The curriculum at the Technion includes the infrastructure of mathematics, physics and computer programming courses required of all engineers, followed by a series of courses in surveying and mapping, geodesy, photogrammetry and cadastre, and accompanied by college required courses and courses of students choice. The standard of education offered by the Technion is considered very good relative to leading institutions in the world. The division of geodetic engineering at the Technion has had some 40 students graduating in each of the past six years, with approximately 10 graduates obtaining advanced degrees each year. The teaching and research activities of the division of geodetic engineering are in the areas related to theoretical and practical aspects of surveying, mapping and geodesy. The division is responsible for the geodetic undergraduate and graduate programs of the department. Graduating in one of these programs is mandatory for obtaining Land Surveying License in Israel. Beside its own programs, the division offers surveying service courses to students from the Civil Engineering and Architectural Engineering departments. Surveying and geodesy: Precise surveying techniques for solving engineering problems; structure deformation monitoring; design and analysis of control networks; geometric and physical geodesy; calibration of surveying equipment; combining classical surveying with satellite (GPS) measurements; gravimetry. Cartography and mapping: Computer assisted mapping; Geographic and Land Information Systems (GIS/LIS); spatial data handling; generalization, matching, conflation, multi-representation and multi-scale of digital maps; automation of data capture and editing; quality control of digital mapping; thematic mapping. Photogrammetry and remote sensing: Advanced analytical photogrammetry techniques; use of digital aerial and satellite images; automatic DEM and orthophoto generation; pattern and object recognition for scene analysis; converting raw image data to explicit information; sensor and data fusion; photogrammetry/GIS linkage; close-range and real-time photogrammetry. 1. A four-year program, leading to the degree of B.Sc. in Geodetic Engineering. The program is aimed at training engineers for filling leading positions in projects, research and special works in the areas of geodesy and mapping. 2. A three-year program, leading to the degree of B.A. in Geodetic Sciences. The programs include most of the basic, required and geodetic courses of the four-year program. The program does not include some engineering courses from other divisions of the department of Civil Engineering. 1. M.Sc. in Geodetic Engineering: for students with geodetic engineering (or, with some additional courses, for students with other engineering background). 2. M.Sc. in Geodetic Sciences: for students with non-engineering background who are interested in theoretical/algorithmic aspects of mapping and geodesy. Precise and conventional surveying: GPS receivers and processing software; total-stations; theodolites, electronic distance measurement equipment; levels; gyrotheodolite; laser alignment instrument, basic optical tooling equipment. GIS and computer mapping: UNIX workstations and PC/WIN NT with GIS and image processing software (ArcInfo, ArcView, MicroStation); scanners; digitizer; large-format (A0) inkjet plotter. Israel is a small country, the mapping practice relies more heavily on aerial photography rather then satellite imagery. Nevertheless, it should be mentioned that a number of universities, amongst them Haifa University, Bar Ilan University, Ben Gurion University in the Negev, Tel Aviv University and the Hebrew University of Jerusalem, offer a variety of courses in Remote Sensing and in its integration with GIS. The modern Israeli Cadastre is based on Torrens principles (Registration of Titles) and it covers the following roles: legal (land transfer, land market), fiscal (land valuation, taxation, assessment), and multiple purpose role (land management, planning, land development, local government and utilities management, emergency management etc). The Israeli cadastre is a juridical official register, shows the de facto legal status of all parcels and properties in a state. As far as legal property titles are concerned, the cadastre shows their scope and the part of the surface to which they extend. All relevant facts, such as location, area, use and parcel boundaries as surveyed. Today, the cadastral information is a part of integrated information systems and it improves the overall land management process. The last two decades has seen moves to establish a complete computerized cadastral information system. There is only one comprehensive cadastral system, a Title Registration system, covering the whole territory of Israel. Two governmental institutions are involved in cadastral system i.e. Survey of Israel (SOI) providing the technical aspects, surveys, mapping etc and the Land Registry Office providing the registration, transfers etc. The Survey of Israel (Ministry of Construction and Housing) is responsible for cadastral mapping, as a part of an inter-ministry procedure of documentation and registration of rights to land. The responsibility for the inspection and the approval of Cadastral Maps and Mutation Plans is shared by five district surveyors and three civil servants acting at SOI central office. The Land Registry Office (Ministry of Justice) is the governmental institution, which has the responsibility for registration of legal rights in real estate properties (land parcels and condominium units). The scope of its activity is over the whole State of Israel and it operates through its 12 regional offices. The modern Israeli Cadastre was based on Torrens principles (Registration of Titles). The main unit in the cadastral system of Israel is the cadastral parcel. About 21,000 square km of the registered area (5% of the area is not registered yet) are divided into some 15,000-registration blocks, and 800,000 parcels. The cadastral systems in Israel are operated by two governmental institutions i.e. Survey of Israel and the land registry office. Land parcels are surveyed in the field while the corresponding land ownership titles are recorded in the Land Registry. Two different types of real properties can be registered: land parcel and apartment in condominium. All types of real properties have a unique identity number and are registered separately. The registration blocks - which might include more than one parcel. The cadastral map shows all land parcels graphically. The Land Book identifies the legal rights based on the cadastral identification. A land parcel is defined as a piece of land delimited by its boundaries and represented in a cadastral map. Every parcel has its unique parcel number within so called "cadastral unit". Land parcels, are surveyed in the field and survey plans are submitted to the Survey of Israel for checking in accordance with Survey Regulations and conditions of the Town Planning. Only when a survey plan is approved as to survey, leases are registered accordingly. Changes of rights to land do not take effect before being registered in the land register. a. Record of ownership (land books and condominiums registers) managed by the land registry office. Textual component, which includes all land parcels and identifies owners' rights, restrictions, and responsibilities, ownership, special rights, mortgages, area of land parcel, history of the parcel etc. The record of ownership is fully computerized, updated daily and is available on the web. b. Cadastral maps, survey documentation (about 30,000 “field books”) and geodetic information files corresponding to the registered title with unique identifiers, managed by Survey of Israel. A spatial component contains the geometric and spatial descriptions of parcels based on boundary surveying process on the field. Most of land parcels have been registered in Israel (about 5% of the area is not registered yet) and about 900,000 real properties (condominium units and others) are not registered yet. The total number of Cadastral parcels in Israel is over 800,000, these are mostly governmentally owned parcels, and about 7% of the occupied parcels are privately owned. 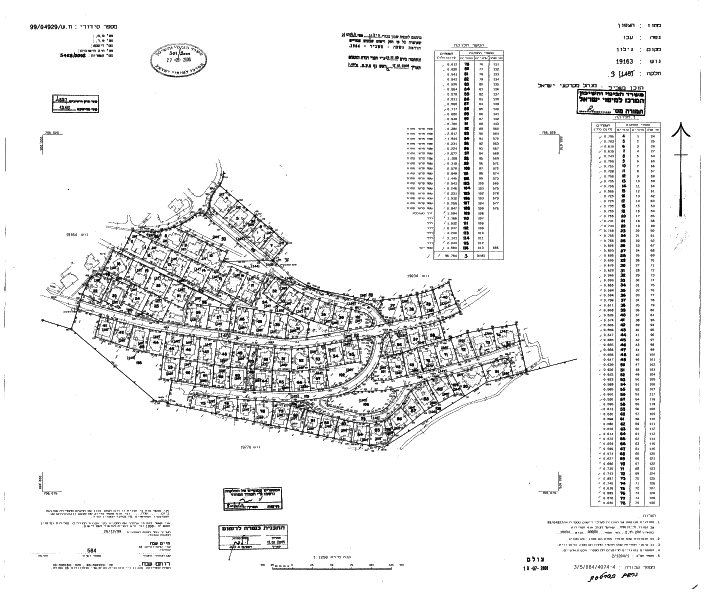 The cadastral block maps (about 15,000) have been completely digitized and supported by field notes and survey Plans. Two main kinds of rights of land can be registered in the land register: full ownership and long-term lease. In the current analog cadastre, the cadastral map constitutes an integral part of the registration and serves to describe the property. The cadastral maps, intended to ensure the rights of the owner (individual or the State) to the property. Each administartive unit (village, local municipality, etc.) is divided into registration blocks, and each block is divided into parcels. Measurment results are recorded in field books and used to determine the boundaries of the block and the parcels, as well as other features (buildings, fences, electricity poles, etc.) on a field plan sheet. Maps of the blocks are based on the file sheet, consisiting of scaled drawings of all parcels in the block and all included features. These block maps contain neither the measured data nor any dimensions whatsoever of the parcel boundaries. The whole country is covered with uniform cadastral maps containing geographical information about: parcel boundaries and boundery corner points, parcel numbers, administrative boundaries of districts, survey control points, outlines of houses and buildings, street names, scale, coordinates, name of district, name of sub district, name of village, number of block etc. The present cadastral map lacks any altimetric information, the contour lines are not drawn and the altitude of control points and objects is not noted. The area included in each cadastral map (cadastral block map) changes according to the block’s boundaries. The scales of the block plans are from 1:625 to 1:50,000 and the sheet size is about 60*70 cm. Most of the cadastral maps are in 1:1,250 and 1:2,500. The accuracy in which the boundaries are defined (0.5-0.8 mm at the block scale) is quite heterogeneous as a result of methods and equipment that were used. Many blocks were plotted in the past manually based on chain surveying measurment, without calculating coordinates. Control of measurment and plotting was carried out by measuring straight distances (“frontages” and diagonals) in the field and comparing them and the same distances as obtained in the drawn map. The quality of the cadastral maps improved with the development of modern measuring instruments and introduction of the polar method in cadastral measurements, while concurrently, new cadastral maps were being drawn by plotters based on calculated coordinates. Another improvement in quality and accuracy of cadastral maps took place in the course of the 1980s and 1990s following the increased accuracy of the national control networks (use of GPS, etc.). In the late 1980s, SOI started preparations for GIS/LIS era. It has been decided to scan and digitize the existing block maps. Since 1993 cadastral maps are converted into digital form (digitized by private contractors) under strict quality control and are entered into the computerized GIS database. Most of the country is now covered by digital (vector or raster) cadastral data. The graphic inputting of the analogue cadastral maps is carried out according to defined specifications, primarily: scanning of the graphic material, automatic vectorization of the scanned raster, manual completing and graphic editing by operators (technicians, draftsmen). Within this framework of treating the cadastral data (a project in advanced stages, nearing completion), the graphic limited quality and accuracy of the blocks is preserved – and therefore the database that is craeted does not constitute a cadastral statutory validation for the borders of parcels and blocks. According to the Israeli surveying regulations, the renewal of cadastral boundaries is to be performed according to the original surveying data (field books) and not according to the graphic map. From the judicial standpoint, it is still the paper map (hard copy) and not the digital map (soft copy) which constitutes the valid and statutorical document. The registartion maps in Israel are currently kept in the district SOI offices in the original form and are distributed as needed in hard copy form on paper sheets. The latest development is a software, permitting the viewing of any cadastral document (including field books) and its extraction from the data base for a nominal fee. In the land registration practiced in Israel, the mutation plan is an integral part of the register and it serves as geodetic component of the register and its revisions. 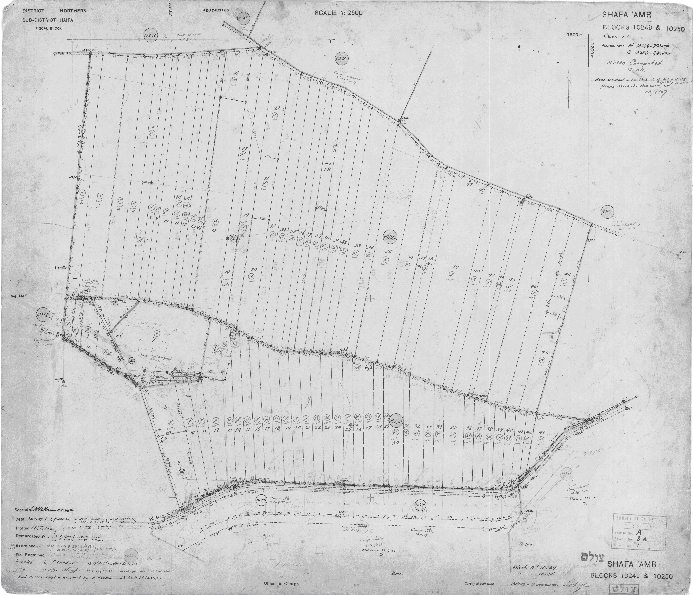 The accurate mutation plans are an important factor in keeping the records up to date and contribute to the reliability of the land register. The 2D mutation plan presents the existing surface subdivision as well as the new one, the areas of the parcels, their shape and precise location. The current mutation plans, do not include altimetric information at all. The mutation plan does include information on surface attached details, such as buildings, fences, roads etc. Figure 1: Example of a Block Sheet. Figure 2: Example of a Cadastral Block Map. The National Topographic Data Base. The National Cadastral Data Base. Considering the graphical character of the topographical mapping which existed in the late eighties and its non-uniform accuracy, it was decided to establish a reliable data base by collecting new digital data and re-mapping the country. The data collection was based on black and white new aerial photography at 1:40000 scale, controlled by GPS measurements. Data acquisition was achieved by analytical and digital stereo-plotters and executed by private companies in accordance with strict specifications, which included the newly developed Unified Digital Feature Coding. The planimetric and altimetric accuracy of 2 meters accommodates mapping from the database at scales from 1:25,000 to 1:5,000. Quality control and formats for digital data transfer and exchange have been developed and maintained by the Survey of Israel. The estimated cost of the primary establishment of the topographical database is approximately US $ 270 per square kilometer. The established data base permits derivation of maps at 1:25,000, 1:10,000 and 1:5,000 scales with automatic generation of the so called “work maps” utilizing specially developed look-up-tables. A new basic topographical map series of the country at 1:25000 scale is in progress. Hydrographic mapping has recently started and will be developed as a part of the national GIS framework. The main problem in topographical mapping is the continuous updating of the digital GIS data base. The first revision cycle started in 2000. A research and development project aimed at defining methods for automatic revision is in progress. The juridical character of the cadastre in Israel requires that parcel boundaries must be uniquely defined by survey and the rights to the parcel registered by the government. Any change in parcel boundaries must be accompanied by an approved mutation plan. Approximately 800,000 parcels cover the country, grouped in 15,000 blocks. The cadastral scales vary between 1:625 to 1:10,000 and estimated accuracy is 0.5-0.8 mm at the block scale. Neither new cadastral mapping, nor re-computation of boundaries were considered feasible and therefore it has been decided to scan and digitize the existing block maps. Thus, most of the original data of the National Cadastral Data Base has a digital form but a “graphical” accuracy. In the late 1980s, the SOI started preparations for GIS/LIS era. It has been decided to scan and digitize the existing block maps. Since 1993 cadastral block maps are converted into digital form (digitized by private contractors) under strict quality control and are entered into the computerized GIS database. Most of the country is now covered by digital (vector or raster) cadastral data. The graphic inputting of the analogue block maps is carried out according to difined specifications, primarily: scanning of the graphic material, automatic vectorization of the scanned raster, manual completing and graphic editing by operators (technicians, draftsmen). Within this framework of treating the cadastral data (a project in advanced stages, nearing completion), the graphic quality and accuracy of the blocks is preserved – and therefore the database that is craeted does not constitute a cadastral statutory validation for the borders of parcels and blocks. According to the Israeli surveying regulations, the renewal of cadastral boundaries is to be performed according to the original surveying data (field books) and not according to the graphic map. From the judicial standpoint, it is still the paper map (hard copy) and not the digital map (soft copy) that constitutes the valid and statutorical document. The cadastral maps in Israel are currently kept in the district SOI offices in the original and distributed as needed in hard copy form on paper sheets. The latest development is software, permitting the viewing of any cadastral document (including field books) and its extraction from the data base for a nominal fee. The principal layer in the cadastral GIS database is the parcel layer of parcels. This layer, which is the heart of the cadastral system has been strengthened and currently revised. New mutation plans are immediately incorporated digitally as well the newly settled blocks of parcels. Today the database is on the threshold of a major change in its character and in the processes involved. This change is triggered by technological advances in the production processes of the GIS, amongst them change in the software operating the data base of the National GIS and the change of the workstation model for end users. Figure 3: Example of a Mutation Plan. 1. Accelerating Registration: About 100-150 new land settlement blocks and 1000-2000 registration plans are completed at the SOI per year. It is a regrettable fact that approximately 400 registration plans await the checking (and approval) process for a considerable number of months. It has been decided at the SOI to eliminate the waiting period. An effort will also be made to shorten the checking process itself to a minimal period. The development of means necessary to shorten the checking period is already under way. We are working on sophisticated and uniform checking processes and on the software, which will monitor the process within the agency and permit its effective management. In 2004, the director general appointed 10 selected private surveyors to whom authority is delegated to check the registration plans submitted and to approve the checked plans within a very short period. 2. Legal Coordinated Cadastre: The establishment of legal analytical cadastre, based on coordinates, is one of the principal goals of the SOI. The SOI plans to implement full legal analytical cadastre in Israel by 2010. Only that kind of analytical cadastre will bring us to the stage where the cadastral information in the national GIS (National Cadastral Data Base) will achieve a legal status in defining land property boundaries and their restoration as necessary, in a uniform manner from the point of view of accuracy and reliability. The ultimate goal is to achieve an accuracy of 5 cm (at 95% confidence level). The current Survey Regulation (1998) was written to achieve in every new cadastral project. About 7000 mutation cadastral plans (“re-parcellations”) and about 1400 registration blocks that were prepared by SOI since 1994, also meet this goal. It was achieved by using combination of GPS horizontal control and EDM, in the New Israeli Grid. 3. Development of a better cadastral practice at the survey of Israel: A comprehensive project for establishment a better highly standardized and homogenously regularized cadastral practice. The project includes development of a software application for control, follow-up, management and decision-making. 4. Classification of licensed surveyors: Classification of licensed surveyors according to the quality of cadastral block maps and mutation plans prepared by them. The idea is to correlate between the classification of the surveyors and the level of inspection carried out by the survey, establishing a more effective inspection and approval procedure. 5. 3D Cadastre: The Israeli government decided in 1999 and in 2000 to improve the efficiency of the land use. These decisions are pointing at the government’s interest in implementing the multiplayer cadastre. The governmental decisions included orders to modify the laws and the conditions that will facilitate utilization of a land site for a number of uses, both above and below the surface. In order to carry out the government decisions, the SOI nominated a team of experts to examine a comprehensive solution, taking into account all the issues concerning the 3D cadastre. This R&D project was one of the steps undertaken by the SOI during the last 6 years concerning the efforts to replace the existing two-dimensional (2D) cadastral system by a three-dimensional (3D) one. The R&D project had been carried out by 5 experts from different disciplines: Cadastre, Geodesy, GIS, Law, Planning and Construction, Geology and Soil Engineering. The Ministry of Finance has approved a budget of approximately one million US$ for the R&D project and for five pilot projects. The R&D project started in September 2002 and has been successfully completed during August 2004. In order to practice the 3D exploitation potential by different interested parties, it is necessary to define a legal and cadastral solution capable of registering rights in a multiplayer cadastral reality. The “Spatial Sub-Parcel” Alternative provides a solution for the registration of spatial objects, not adjacent immediately to the registered surface parcel, whereas each one of those spatial objects is subject to defined rights and obligations. The activities in the subterranean space and in the above-terrain space will be made possible through an allotment or expropriation of specific parts of the space included within the vertical boundaries of the surface parcel. The spatial registration will be achieved by sub-dividing the surface parcel space into spatial sub-parcels. The definition of the surface parcel will remain unchanged. Any project established in one of the spatial sub-parcels (above or bellow the surface) will be bounded and defined stereometricaly by a final 3D outline and its volume. A spatial project, which extends above or below a number of surface parcels, will be thus subdivided into spatial sub-parcels, in accordance with the existing surface parcels. If required, it will be possible to consolidate the spatial sub-parcels, within a registration block, into one spatial parcel. The Title Rights to the surface parcel will be preserved according to the existing definition of the surface parcel as extending infinitely above and below the surface. However, the spatial sub-parcel will be defined as a finite volumetric object, subtracted from it. The spatial sub-parcel will be included in the existing registration block as a part of the surface parcel. The existence of spatial sub-parcel will be noted also in the Title Register. The Register will include the 3D definition of the spatial sub-parcel. In the case of consolidation of several spatial sub-parcels into one spatial parcel, this spatial parcel will be registered separately in the Register and in the registration block. 3D Definition and registration of spatial parcels. Proposals for changes in the existing Land Law, the Planning and the Construction Law, considering the applicable engineering and planning constraints. Accumulation of the altimetric data to be added to the 2D cadastre, thus creating the 3D database. Solution to the management of analytical cadastral information, in 2D and 3D GIS environment. Establishment of an active computerized model of registration of rights to land in a spatial concept. Development of suitable software for the visualization of 3D cadastre. Modification of the Survey Regulations in order to facilitate registration of 3D cadastre. 1. Accelerating Registration: The development of means necessary to shorten the checking and approval process to the minimum is already under way. We are working on sophisticated and uniform checking processes and on the software, which will monitor the process within agency and permit its effective management. In 2006, According to the survey regulations, the director general authorized private surveyors - by delegation of power - to execute the supervision of mutation plans prepared by other licensed surveyors. SOI keeps the right of the final approval to itself, but also commits itself to complete it within 21 working days. Currently, supervising surveyors check some 35% of the mutation plans. The results clearly prove that the integration of governmental and private professional knowledge and the mutual willingness for cooperation contribute essentially to a better cadastral practice. 5. 3D Cadastre: Starting from October 2004, there has been active in SOI a 3D cadastre division. This division leads the activities for the preparations by SOI for the implementation of 3D cadastre in SOI, and aids in advancing the subject also outside SOI – in government ministries, government bodies, and in academia. Legislation: Modification of major and secondary legislation for spatial registration of titles and the multi-layer exploitation of land. For more than a year, a legal implementation team, has been active. The major task of the team is the determination and formulation of the necessary changes to the major legislation that will permit the implementation of the recommendations of the 3D Cadastre R&D team. Registration: Preparation of the land arrangement and registration department for the registration of titles to spatial sections. Formulation of work programs and development of capabilities for spatial and multi-layer registration in the land registration offices. There is currently being completed the execution of overall characterization of a new and advanced information and registration system that will replace the existing system (dating from 1989) in land registration offices. Overall characterization of a new system for the management of land registration and arrangement so that it will meet the current and future professional requirements and match the modern technologies and information both inside and outside the ministry, including capabilities of information sharing and integration between different information systems and the registration of underground and above ground land (3D cadastre). Planning: Formulation of professional directions for multi-layer planning, including both the underground and above ground space. The major activity in the subject of 3D planning has been done up to now as part of the Uniform Format for Zoning Plans Procedure (UFZP), prepared by the Planning Administration in the Ministry of the Interior, that came into force at the beginning of April 2006. Appendix C of the UFZP procedure contains directions for the preparation of 3D planning plans. According to the UFZP procedure the 3D plan is a plan for a project in which ground objectives and various uses are planned, both underground and above ground, that are expected to be under different ownership and/or operated by different bodies, and that which generally require different instructions for each objective. Surveying and mapping: Preparation inside the SOI organization for 3D cadastral surveying, mainly in the subject of surveying, editing, and auditing of plans for the purpose of spatial registration. The work of updating the Surveyors Regulations currently being carried out, and in which is planned to be completed by the end of the year, also includes adapting the Surveyors Regulations for 3D cadastral surveying and for the results of 3D registration, so as to permit the measurement and editing of a spatial plan for purposes of registration. 7. Cadastral Information Supply via Internet: One of the important tasks of the cadastral activity in Israel is the preparation of mutation plans, which serve as a principal instrument of block parceling change. The Survey of Israel (SOI) is responsible for supply of necessary cadastral information for mutation plans preparation. In the past there was a specific form of recording the mutation plans sequence in the blocks. The purpose of this form was to list mutation plans ID, to record parcels numbers and to trace the origin of each parcel existing in block. For many years the recording procedure was based on managing of specific paper block cards. A few years ago SOI has initiated and completed a development of a computerized information system that would store and provide information about block parcels and mutation plans. As time went by, this system became an important part of cadastral process. In spite of a progress made, in order to obtain important information, a client was obliged to arrive personally to SOI office. After analysis of situation, SOI made a decision to expand the developed system accessibility by supplying its information via Internet. As a result of this innovation, now every professional, sitting in his office, may immediately obtain essential information concerning specific block, mutation plan or land parcel and get surveyors’ contact details. The information is supplied at present free of charge. SOI relates to the new experience as a first progressive step in direction of increasing its activity in data supply via Internet. 8. New Survey Regulations: The Survey of Israel (SOI) is responsible for preparing and updating Survey Regulations for Geodetic Control Networks, Topographic Mapping, Cadastral Surveys and related activities. Licensed Surveyors in Israel are obliged to work according to those regulations. The last regulations were officially issued on June 1998. The need to update those regulations was felt mainly because of the latest developments in a number of surveying technologies. The state of the art technology of permanent GPS stations equipped with RTK capability of defining centimeter-level 3D positions in real time, dictated such an urgent need, as well as other developments (like LIDAR etc.) in topographic mapping technology. The existing regulations (from 1998) contain a chapter entitled "Surveying and Preparing Plans for Registration Purposes". Those plans for registration are mainly mutation of the cadastral parcels (re-parcelation) that are made in order to register changes of the cadastral boundaries and rights. According to the Planning and Building Law they have to conform to Town Plans. SOI have to check and approve each registration plan before it goes to the registration office at the ministry of justice. 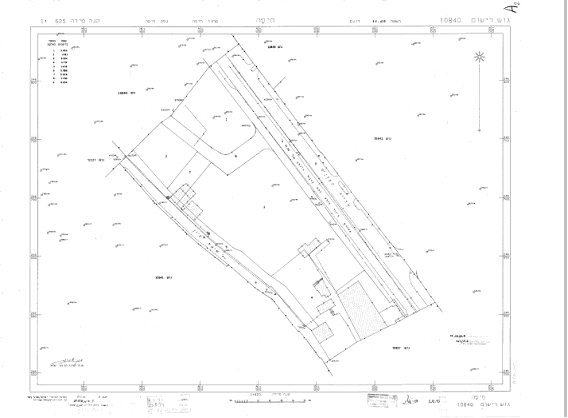 The 1998 survey regulations and their adjunct "manager's technical instructions" contain a requirement to compute the coordinates of every boundary point as well as detailed instructions for its digital format (named SRV) which is suited to feed the cadastral LIS. However there is another demand for demarcation of every turning point of the cadastral boundaries. In case of disagreement between the coordinates and the mark in the field, the mark in the field is considered as the legal boundary, as long as it is regarded as the authentic boundary mark. Authorization of the authenticity of the boundary marks is the heaviest task of the surveyors who prepare the registration plans and those who should approve their work. It is also a common source for boundaries disputes. However the requirement for demarcation of boundaries and the superiority of the boundary marks over their coordinates is needed as long as we do not have the possibility to achieve a desired accuracy in which we want to define the coordinates of the boundaries, i.e. a stable, accurate and homogenous control network and reference frame. This situation was already changed lately, and the new regulations for the geodetic control networks will accomplish its formal aspects. Proper EDM or GPS measurements of boundaries, based on the described horizontal control, will assure the desired accuracy of the boundaries definition. A main issue in the new regulations is to assure the legality of the coordinate-based cadastre. There is still (July 15, 2006) a debate to be decided by the Director General of SOI whether the boundaries demarcation as a part of the plan for registration is optional or mandatory. It should be obvious that the superiority should be given to what was first, i.e. are the coordinates a result of measuring the boundary mark, or was the demarcation done according to the coordinates. Any how the new regulations and technical instructions should make sure that the demarcation and measurement of cadastral boundaries will be accurate and reliable. Forrai J. (2006). Integration-trend of Separated Land Tenure Governance Systems. FIG Workshop on e-Governance, Knowledge Management and e-Learning, Budapest, Hungary. Forrai J. , Kirschner G. (2006). Operating Supervising Surveyors – Two-year Experience of an Unusual Governmental Enterprise. XXIII International FIG Congress, Munich, Germany. Klebanov M. , Forrai J. (2006). Experience of Cadastral Information Supply via Internet. XXIII International FIG Congress, Munich, Germany. Steinberg G. (2006). New Survey Regulations for Israel. XXIII International FIG Congress, Munich, Germany. Shoshani U., Benhamu M., Goshen E., Denekamp S. and Bar R. (2005). A Multi Layers 3D Cadastre in Israel: A Research and Development Project Recommendations. FIG Working Week, Cairo, Egypt. Forrai J., Kirschner G., Klebanov M. and Shaked R. (2004). Classification of Licensed Surveyors. FIG Working Week, Athens, Greece. Shoshani U., Benhamu M., Goshen E., Denekamp S. and Bar R. (2004). Registration of Cadastral Spatial Rights in Israel a R&D Project. FIG Working Week, Athens, Greece. Forrai J., Murkes S., Vonznesenky L. and Klebanov M. (2004). Development of a Better Cadastral Practice at the Survey of Israel. FIG Working Week, Athens, Greece. Benhamu M. and Doytsher Y. (2003). Toward a Spatial 3D Cadastral in Israel. In: Computers, Environment and Urban Systems, Vol. 27, pp. 359-374. Grinstein R. (2003). A Real-World Experiment in 3D Cadastre. In: GIM International, Vol. 17, pp. 65-67. Benhamu M. and Doytsher Y. (2001): Research Toward a Multilayer 3-D Cadastre: Interim Results. Proceedings of international workshop on “3D Cadastres”, Registration of properties in strata, Delft, The Netherlands. Doytsher Y., Forrai J., and Kirschner G. (2001). Initiatives Toward a 3D GIS-Related Multi-Layer Digital Cadastre in Israel. FIG Working Week, Seoul, Korea. Forrai J., Kirschner G. (2001). Transition from Two-Dimensional Legal and Cadastral Reality to a Three-Dimensional Case. Proceedings of international workshop on “3D Cadastres”, Registration of properties in strata, Delft, The Netherlands. Steinberg G. (2001). Implementation of Legal Digital Cadastre in Israel. FIG Working Week. Seoul, Korea. Adler R., Forrai J. (2000). Surveying and Mapping in Israel - The Mediterranean Surveyor in the New Millennium. FIG Seminar, Malta. Fradkin K. and Doytsher Y (1998). Establishing a Digital Cadastre in Israel. Proceedings of FIG 21st International Congress of Surveyors, Brighton, England. Forrai J., Raizman Y. and Gavish J. (1998). The National GIS in Israel. GIS OPEN, Szekesfehervar, Hungary. Fradkin K. and Doytsher Y (1997). A Method for Establishing an Accurate Urban Digital Cadastre in Israel. GIS/LIS Annual Conference, Cincinnati, Ohio, USA.